An internship is a process where recently graduated students specializing in a particular subject, undergo a supervised practical training before a full-scale employment. Internship Resume assists them in their search for the right opportunity with the best possible organization. The Resume Samples listed below are crisply drafted to allow the user to utilize it as a benchmark to create his/her own resume. He/she could follow the said pattern or be innovative in his/her approach to be more efficient. When an engineering graduate applies for an internship at a leading company, his/her objective, education, relevant coursework, and experience should be neatly documented in addition to other information. 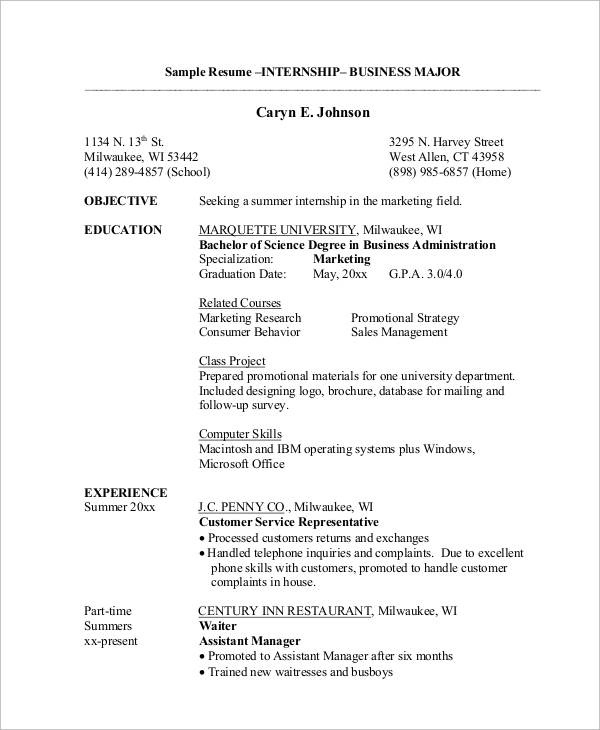 When a marketing graduate applies for Internship Resume Samples in a marketing position, the resume should highlight his/her objective, education, related courses, skills experience and awards/activities, etc. References available on request are mentioned as a footnote. The format here is slightly different and commences with professional goals followed by education, pre-internship experience, teaching related experience, other experience, and information about awards, etc. 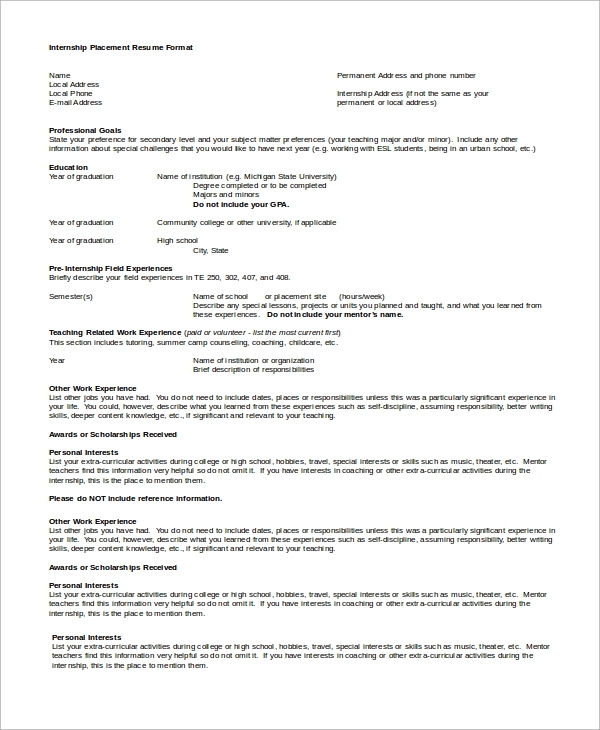 The Sample Internship Resume presented in this report has a combination of versatility and creativity to assist qualified and worthy students to apply for intern positions most suited to their profile. Reputed and established organizations seek such candidates who can blend in with their work environment and culture. The first point of interaction with the candidate is through the resume, and evidently, its importance cannot be disregarded or taken lightly. To ensure that his/her application is given due consideration, the candidate should go that extra mile to create an effective, constructive and potent resume with appropriate information. 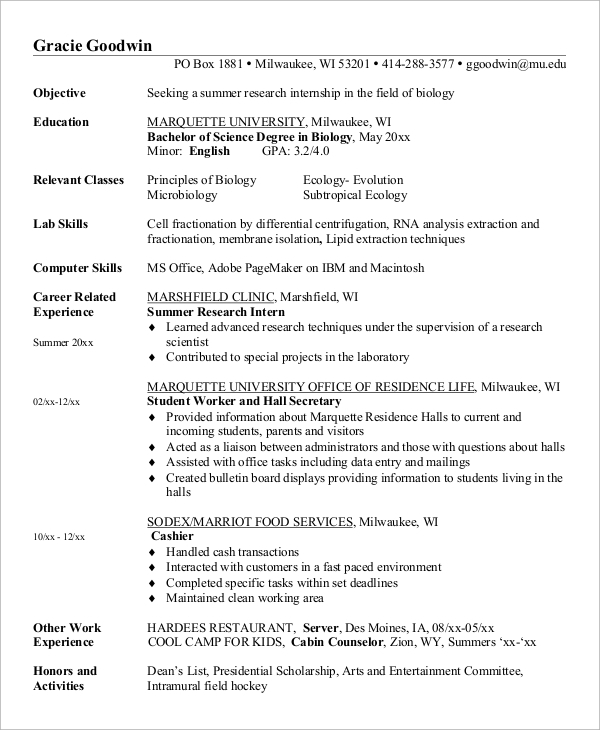 The Sample Resume, in this case, is for an internship in the field of biology. It contains information about education, relevant subjects studied, lab skills, career oriented and regular work experience, etc. The applicant, in this case, is applying for a position in system programming. Information about qualifications, skills, educational projects, professional experience and other activities are well documented. 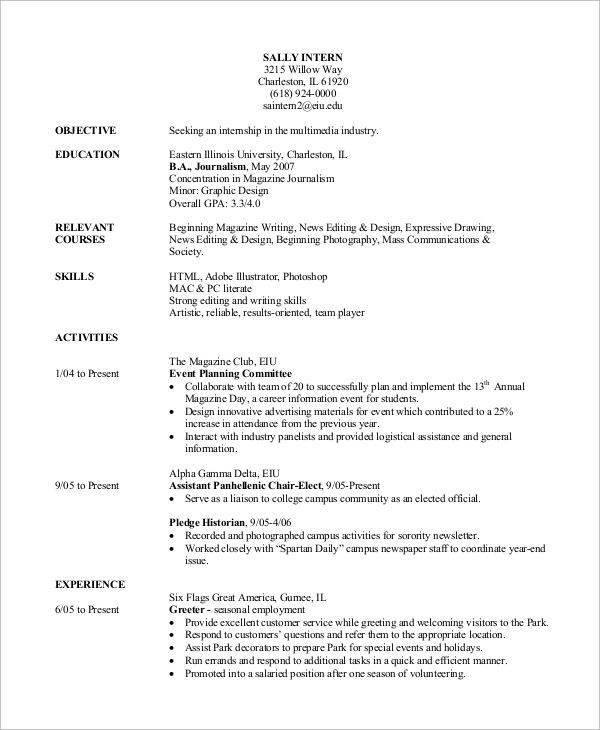 What are the Uses of these Resumes? Go through all the Resume Examples and check which suits your profile the best. There are various options, but don’t copy paste, use it only as a guideline. Being original is a trend-setter, and employers look out for that creative angle during the interview. 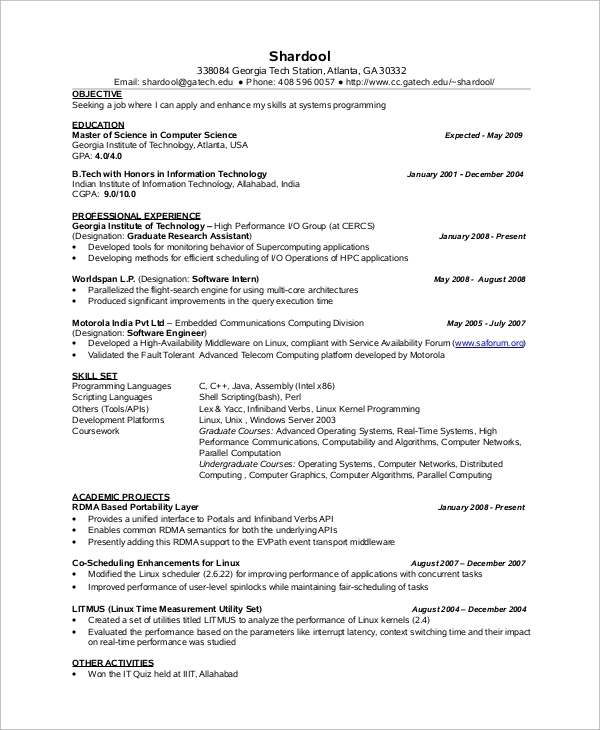 When and Which Resume to Use? Do a little research on the company where you are going to submit your resume. Maybe that will give you an indication of what type of resume to use, skill based, summary, objective or professional. Ideally, the resume should contain the information relevant to the job profile and include all such details only. 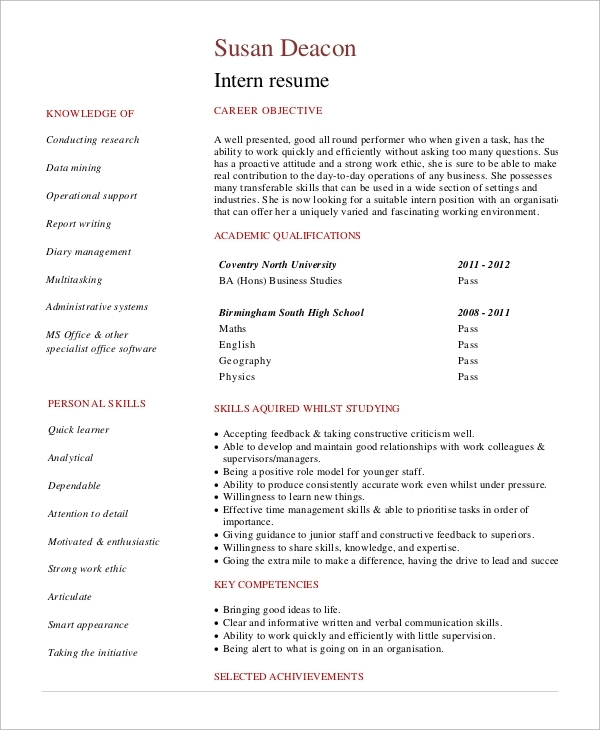 Internship Resume undoubtedly is of immense help to a candidate. He/she has the options to make his/her choice. Ultimately the final decision on how to write, and in what format lies with him/her. 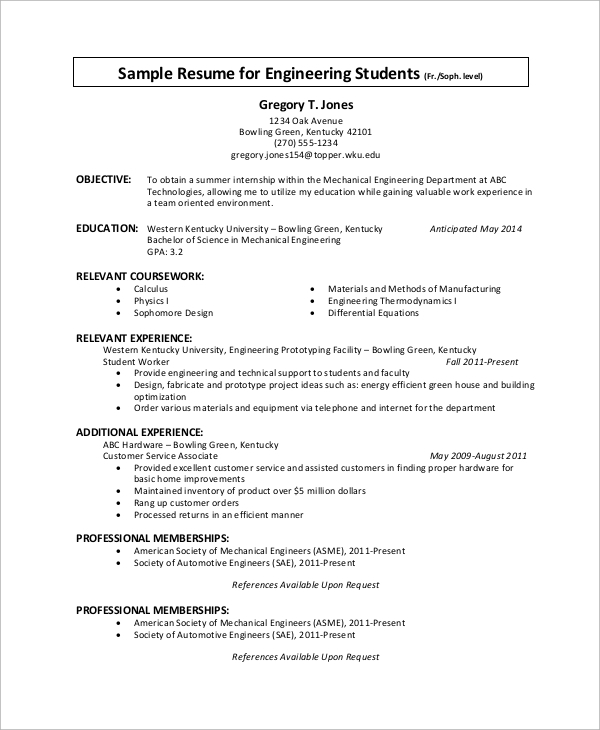 Using the Sample Resume in the best manner possible should be his/her single-minded purpose.